Image caption: Third-year infielder Courtney Stump (Kutztown, PA/Kutztown HS) pictured here getting in position to field a ground ball. She hit for an average of .213 last season while scoring 15 runs. She also hit two home runs. Last season was a historic season for the West Chester Golden Rams’ softball team. Last year, the Rams celebrated their fifth consecutive PSAC title, and captured the NCAA Division II Atlantic Regional Championship for the second time in program history. Their season came to a close, however, at the National Finals in Salem, Virginia, where they lost 4-0 to No. 1 seed University of North Georgia. It was West Chester’s first trip to the National Finals since 2014. Along with the Golden Rams’ great team success in 2018, last season also brought impressive individual success as well. Coach Lokey earned PSAC East Coach of the Year and NFCA Atlantic Region Coach of the Year honors, while eclipsing the 500-win plateau for her career. 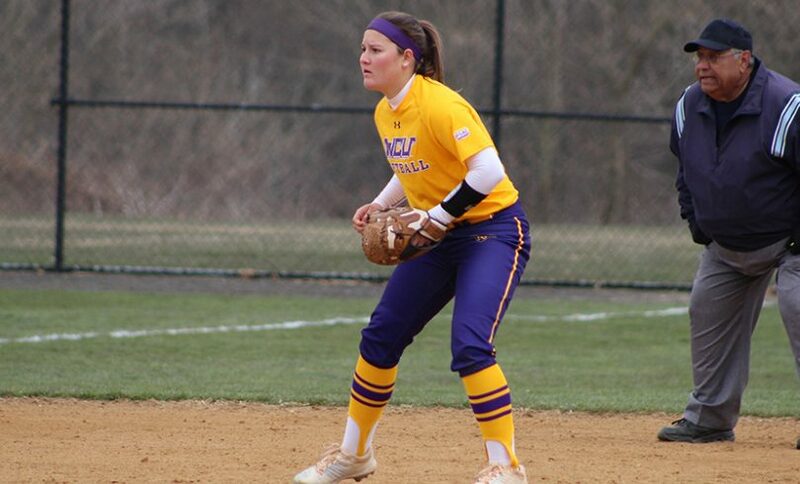 West Chester also tabbed the PSAC East Player of the Year for 2018 in Bri Garber (Willow Street, Pa./Lampeter-Strasburg). Garber is now entering her junior season, where last season she led the PSACs in an array of categories including batting average (.436), at bats (195), runs (59), hits (85), walks (31) and on base percentage (.514). Along with Garber’s historic season, the Golden Rams saw plenty of production in other places through their lineup. Three of their top five leading home run hitters, Heidi McCollester (West Chester, Pa./Henderson), Emily Maseth (Westminster, Md./Westminster) and Jaime Klemas (South Brunswick, N.J./South Brunswick) are all returning — each having registered five home runs in 2018. These three in addition to Garber will be expected to bolster the young Golden Ram offense in 2019. West Chester is returning three talented pitchers in 2019 as Kelly Tinsman (Ewing, N.J./Notre Dame), Jen Hanshaw (Mechanicsburg, Pa./Cumberland Valley) and Maegen Kavanagh (Easton, Pa./Easton) are all back in the rotation with another year of experience to build off of. Tinsman is the veteran arm on the Golden Rams staff, and she also saw the most action a year ago appearing in 17 games. Earning the start in seven of those games, Tinsman pitched to a 7-0 record with an ERA of 2.83, while also making one save and recording three complete games with one of those outings ending in a shutout. West Chester was recently ranked No. 8 in the Nation in the National Fastpitch Coaches Association (NFCA) preseason poll while also being picked to finish atop the PSAC East by the loop’s coaches for the sixth straight year. The 2019 Golden Rams will try to build upon their historic success from last season. West Chester opened its season on Friday, Feb. 8 in the NFCA Leadoff Classic in Clearwater, Florida against Wayne St. Look for more softball news in additional issues!